This was released to commemorate the 25th anniversary of the Delilah punk rock whisky bar and I tasted it at the Stoke whisky festival earlier this year. Nose: Malt hits first, wild strawberry, biscuit, very creamy, orange citrus, creamy vanilla, the grain comes out more with time. 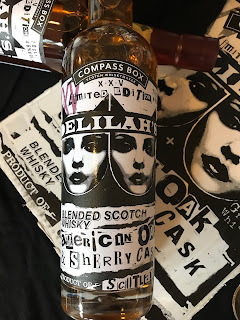 Taste: Strawberry hit, very creamy, malt, biscuit, some heather and chocolate, some spice and oak, gingerbread, vanilla, a little grain whisky into the finish. Finish: Medium length. More of the same. Orange, chocolate, heather and lots of malt. A nice one from CB, middle of the road really. No peat, no Clynelish, just a pleasing whisky for all. I’ve said it before but I’m a big sucker for strawberry in whisky and this is no different. Good stuff.